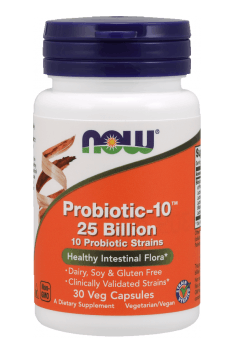 Now Foods Probiotic-10 is a natural dietary supplement with a complex of ten strains of probiotic bacteria and with high efficiency confirmed by clinical tests. Probiotics are live bacteria cultures with an unbelievably beneficial effect, with which the organism is supplied in order to improve the overall health of the organism. Their activity has a positive effect on the digestive, immune and circulatory systems. Bifidobacterium lactis - bacteria present in the large intestine. They alleviate ailments such as flatulence and constipation in people with the irritable bowel syndrome. The bacteria can be helpful in fighting lactose intolerance. They support sugar digestion and microelement absorption. They also ensure the normal functioning of intestines and help to fight pathogenic bacteria. They support the defensive system in the intestines and normal energy production. Additionally, they maintain a normal bowel movement schedule. Lactobacillus plantarum - found in the gastrointestinal tract. They protect the gastrointestinal tract by strengthening the intestinal barrier as well as limit the translocation of bacteria from the digestive system to the portal venous system. They alleviate symptoms in patients with the irritable bowel syndrome, reduce stomach aches and flatulence. They also show the ability to fight pathogens in the organism and maintain important vitamins, nutrients and antioxidants. They support carbohydrate fermentation and breakdown. Lactobacillus casei - bacteria which contribute to the protection of the organism from illnesses and inhibiting the growth of harmful bacteria cultures. They are found in the intestines and the mouth. They produce lactic acid which affects the reduction of the pH level in the digestive system. They also improve digestion and prevent bowel inflammations. Lactobacillus rhamnosus - a strain found in natural intestinal microflora. It is beneficial for health in many ways. Its activity supports the digestive system in fighting ailments such as diarrhoea and regulates intestinal permeability. It helps in respiratory infections and atopic dermatitis. Lactobacillus paracasei - found in the mucous membrane of the oral cavity. It strengthens intestinal flora. It supports the immune system and can contribute to healing infections. Bifidobacterium breve - bacteria which have the ability to break down many food products. They inhibit the development of harmful bacteria. They also affect the digestive system, produce lactic acid and participate in sugar fermentation. Moreover, they support the healing of ulcerative colitis. Streptococcus thermophilus - it affects the digestive system. It supports lactose digestion, alleviates the symptoms of ulcerative colitis. It increases the organism's immunity. It prevents upper respiratory tract infections and fights them. Additionally, it increases the level of good cholesterol (HDL). Lactobacillus salivarius - found in the small intestine and the oral cavity. It reduces the amount of harmful bacteria in the organism. It restores the balance of intestinal flora. It produces natural lactose and participates in its digestion. It maintains the normal pH level in the organism and supports the growth of intestinal microflora. Bifidobacterium longum – found in the gastrointestinal tract. It prevents the growth of harmful bacteria. It ensures the normal functioning of the digestive system. It alleviates the symptoms of lactose intolerance. It maintains the normal balance of intestinal flora. It has anti-inflammatory properties and protects the organism from harmful substances. To sum up, NOW FOODS Probiotic-10 is a dietary supplement for people who have problems with the digestive system, and that is caused by the fact that it significantly improves its functioning and digestion. It maintains normal intestinal flora and reduces lactose intolerance. Recommended after an antibiotic therapy, it can also be used as preventive healthcare. Probiotic-10 25 Billion 30 caps. To preserve the fullness of the product properties, we store and recommend to ship it in cooling conditions. 1 capsule 1-2 times per day on an empty stomach. Following the principle that health starts in the gut, settle useful cultures of bacteria in the digestive system. The diet of modern man, rich in unhealthy products and processed foods is a big challenge for the digestive system. It causes a lot of food intolerance and gastro - intestinal problems. Probiotics are recommended for everyone. They can be used prophylactically, because it not only improves the functioning of the digestive system, but also reduce intolerance symptoms (e.g.. Lactose), strengthen the immune system and help to regulate lipid profile. They are essential for people suffering from various symptoms of gastrointestinal (reflux, heartburn, bloating, constipation, diarrhea, abdominal pain, feeling of heaviness).Probiotics are recommended after antibiotic treatment, when you have to rebuild the intestinal flora, which was damaged during the therapy. The product includes a complete mix of ten strains of probiotic bacteria. I recommend taking one capsule once or twice per day. . It is usual to assume that probiotics should be taken on an empty stomach. Recent studies show that meal protects and buffers the gastric juice, so cultures of bacteria are able to survive the acidic environment of the stomach and reach their destination, namely the intestines. Taking them during the meal will not be a mistake. It regulates the work of the digestive system, has anti-inflammatory effect, improves tissue regeneration. Bifidobacterium lactis is a strain of probiotic bacteria capable of producing lactic acid which are classifed as gram-positive, rod-shaped bacteria. They populate naturally the end part of the ileum and large intestine. Their main function is to compete for nutrients and adhesion sites with pathogenic bacteria. Their properties can be thus desribed as antidiarrhoeal, regenerating the intestinal mucosa, helping the body take in more micronutrients and regulating intestinal peristalsis. This bacteria strain has also the ability to produce lactic acid from lactose or other substances which will hinder indirectly (by acidifying the environment) or directly (by killing bacteria) the growth and survival of such pathogenic bacteria as Salmonella or Helicobacter pylori. The supplementation with probiotic strains helps restore healthy intestinal microflora which is nowadays disrupted by many negative environmental factors.